↑ "Bhadrakali temple | Religious Place | Bhadrak - IndiaOnAPage". indiaonapage.com. Retrieved 2 January 2013. 7-km distance from main Bhadrak city. ↑ "~* Welcome to Bhadrak (Orissa) : The Official Website *~". bhadrak.nic.in. 2010. Retrieved 2 January 2013. The statue of Goddess is of black granite and is seated in lotus posture on a lion. ↑ ୩.୦ ୩.୧ ପଣ୍ଡା, ହରିହର (27 October 2015). "ଅନ୍ତରଙ୍ଗ ଓଡ଼ିଶା: ଭଦ୍ରକର ପ୍ରସିଦ୍ଧ ଶୈବ ପୀଠ: ବାବା ଆଖଣ୍ଡଳ ମଣି". ଓଡ଼ିଶା ଟାଇମ୍. Retrieved 14 September 2016. ↑ ୪.୦ ୪.୧ "ମା' ଭଦ୍ରକାଳୀଙ୍କ ସିଂହବାହିନୀ ବେଶ: ଶ୍ରଦ୍ଧାଳୁଙ୍କ ଭିଡ଼". ସମୟ. 2 November 2016. Retrieved 2 November 2016. ↑ ୫.୦ ୫.୧ Chand, Dr. Soma (1 September 2009). "Bhadrakali : A Complete Study" (PDF). Orissa Review: 126. Retrieved 10 September 2016. ↑ "orissa tourism -Bhadrakali Temple". orissadiary.com. Retrieved 2 January 2013. The temple remains open for visitors and devotees everyday from 6.30 am to 1pm and again from 3pm to 9.30 pm. ↑ "Orissa.net : Bhadrakali Temple". orissa.net. Retrieved 2 January 2013. 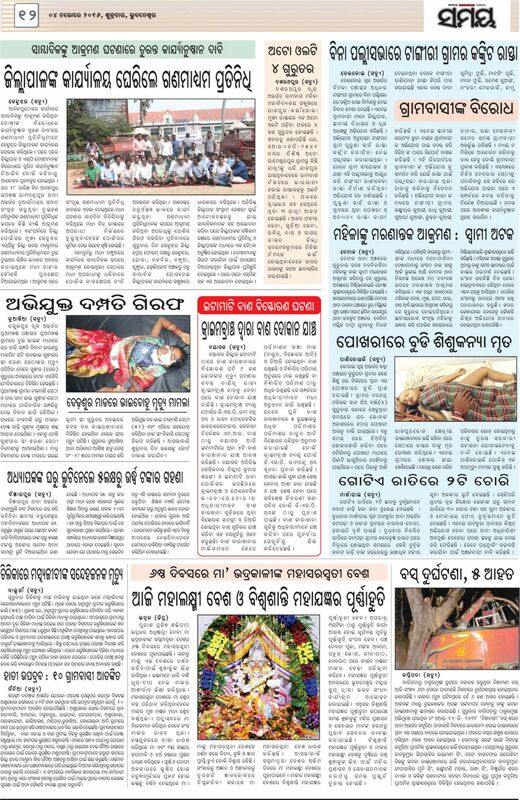 Dixits from Jajpur to perform regular seva-puja & niti (daily worshiping and care taking). ↑ "ଭଦ୍ରକାଳୀ ପୀଠରେ ମହାଯଜ୍ଞ ଆରମ୍ଭ: ମାଆଙ୍କ ବେଦମାତା ବେଶ". ସମାଜ. 30 October 2016. Retrieved 2 November 2016. ↑ ୧୦.୦ ୧୦.୧ "ମହାକାଳୀ ଓ ରାଜରାଜେଶ୍ୱରୀ ବେଶରେ ମା' ଭଦ୍ରକାଳୀ". ସମାଜ. 1 November 2016. Retrieved 2 November 2016. ↑ "ମା' ଭଦ୍ରକାଳୀଙ୍କ ସିଂହବାହିନୀ ବେଶ". ସମାଜ. 2 November 2016. Retrieved 4 November 2016. ↑ "ମା' ଭଦ୍ରକାଳୀଙ୍କ ଜଗଦ୍ଧାତ୍ରୀ ବେଶ". ସମାଜ. 3 November 2016. Retrieved 4 November 2016. ↑ "ଆଜି ମହାଲକ୍ଷ୍ମୀ ବେଶ ଓ ବିଶ୍ୱଶାନ୍ତି ମହାଯଜ୍ଞର ପୂର୍ଣ୍ଣାହୂତି". ସମୟ. 4 November 2016. Retrieved 4 November 2016. ↑ "ଭଦ୍ରକାଳୀଙ୍କ ମହାଲକ୍ଷ୍ମୀ ବେଶ". ସମାଜ. 5 November 2016. Retrieved 5 November 2016.